Noel's Garden Blog: We have the new perennials but where is the new perennial garden? We have the new perennials but where is the new perennial garden? A recent blog post by Marc 'le jardinier' is tries to provoke a discussion about whether the so-called 'New Perennial' movement has had much of an impact on British gardens. His conclusion is 'not much'. The implication is that this should be a surprise. In many ways I agree with him but I don't think it is a surprise. So, here I'd like to do one of those roundups where I look around and survey the scene and ask, “what has really changed?”. Apart from the interest in this as gardeners and landscape designers, it's an opportunity to think more widely about why we garden and about the way that cultural change happens. The 'New Perennial' moniker is an annoying one anyway. Anything with 'new' in the title inevitably comes with a date stamp in the near future. It actually dates to 1996, when Frances Lincoln decided, in one of those moments of genius that made everyone else in publishing think “why didn't I think of that?”, to use it as a title for a book project I had with her company. What the 'new' and the 'perennial' flag up though is that there have been enormous changes in British, and American gardening over the last thirty years, and one of the biggest has been the revival of interest in herbaceous perennials. Looking back to the 1980s, it is actually hard to imagine how people gardened with so few perennials. Anyone who is too young to remember this time would be astonished now at how garden centres and nurseries almost entirely sold shrubs and bedding, with perennials a distinct minority interest. On a recent trip to the US (primarily Ohio) I was amazed by how many gardens featured perennials, mostly echinaceas and rudbeckias of course. In the past there would have been lawn and a square metre of pink phlox if you were lucky. A great sense of satisfaction, and pride, at having been part of the movement that has enabled this. What people have done with the perennials is another thing. As with the grasses, which have been an even bigger shift since the 1980s (back then NOBODY in Britain grew grasses apart from eccentric prophets in the wilderness like Roger Grounds). On the whole they have slotted their geraniums, monardas and Carex testacea into the garden format they had before. Which generally means the borders around the lawn; the ingredients have changed but the recipe hasn't. For those of us, like the people reading this blog post, who are (and trying not to sound too superior here) part of the gardening 'elite', acting as opinion-formers etc., the mismatch between what we think people should do with 'our' plants and what they actually do with them, may be considerable. But take an analogy – think of the amateur art shows we have all been too, usually held in village halls. How many of the artists have done what the art elite seem to describe as art: smear mud on the walls, pile up bricks, carry in their unmade bed and leave it in the middle of the room? None. Elite thinking about art has not penetrated very far into popular culture (do I hear sounds of relief?). No-one in the real world seems to want to practice 'conceptual art'. 'Art' for most people does mean: painting, beauty, colour, form, memory, landscape, portraiture, while Tracy Emin's unmade bed at the Tate is little more than a provocation to chattering class dinner parties. Am I making an analogy between conceptual art and 'new perennial' gardening? Only in as much as they are both elite concerns which have not penetrated popular culture. Personally, I think most conceptual art is crap and new perennial planting isn't. But then I'm not a conceptual artist whose just had a fat grant for hanging tampons on a washing line or whatever. Most people garden to relax, unwind and feel close to the sanitised version of nature that the garden presents us with. They are not interested in trends, concepts and 'movements'. They want something that looks nice and makes them feel good. This means that gardening is one of the more conservative of the arts. And who are we to criticise what people do in their spare time? And another thing – naturalistic planting is systems or community thinking. Its about creating plant mixes and most gardeners do not think like that. They think only in terms of individual plants and how they like them, and maybe find good neighbours for them. They are driven by what looks nice down at the garden centre or the nursery. Fair enough. I don't think we could expect otherwise. And another thing! 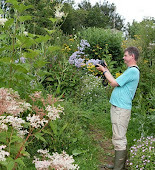 Much of the naturalistic planting featured in garden magazines is large-scale. It's Piet O doing parks or those designers who specialise in large country gardens; some medium-scale and more 'average' gardeners certainly get featured, but there are surprisingly few who really carry it off. One who has tried is featured in the September issue of Country Living; Jo Ward-Ellison in Gloucestershire. Size puts people off. Unnecessarily I think. On of the virtues of naturalistic planting is that it is about building plant communities, which are scaleable and work over a range of sizes. Take a Piet O planting and in many cases you could chop a bit off and stick in your suburban garden to replace the oh-so-boring lawn and with a bit of fiddling it would still look good. The main difference would be that you would be forced to be closer to a lot of the plants so you would appreciate them in a different way to the 'big picture' view. Perhaps no bad thing. More pointedly, I'd like to ask about how much designers and the landscape profession have taken on board 'new perennials' or as I'm going to call it from now on, naturalistic planting? There is no doubt that the range of plants has been massively increased, although there is still a problem about how you sell late-season perennials, as they generally look so awful in pots. The garden centre industry has never really tried although internet sales have come to the rescue to some extent. The huge growth in the garden design profession has gone hand in hand with the perennial explosion although for the most part perennials are used within those designs in a relatively conventional way. Most garden designers still seem to be at the level of slotting individuals together than creating functioning plant communities. The landscape profession, largely under pressure from clients anxious about the maintenance costs of what they pay for, have been cautious, understandably. 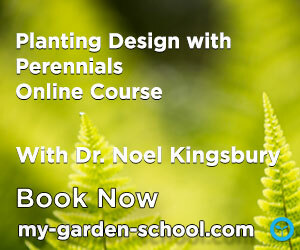 For the most part, they also lack the plant knowledge to know how to use perennials. Many are anxious to learn, as I can see from the folk turning up at my workshops (www.gardenmasterclass.org and www.landscapemasterclass.com). Knowledge about the long-term performance of perennials is also poor; something I am endlessly banging on about, and which I try to address in the workshops. The big change in British gardening, and one also increasingly being followed elsewhere is the 'wildlife gardening' movement. Supported by a strong grassroots interest in conservation and at what we might call the 'official level', i.e by the RHS, this has made a huge impact, and again it is difficult to imagine how this could have happened without the perennial revolution. It stresses diversity, that varied habitats are the best thing we can do for nature, something that the good old British 'mixed border' addresses rather well. Crucially, the wildlife gardening movement also does something else – it gives gardeners permission to be a bit untidy: weeds, dead leaves, unpruned shrubs. That has probably helped a great deal. A wonderful piece of writing; intelligent, insightful, and spot-on. There is another dimension to this question. What would "new perennial" plantings look like outside of the mesic climate where they are traditionally found? How do the concepts of the "new perennial" movement apply,for example, to plantings in Los Angeles, San Francisco, or for that matter Athens or Palermo? I'd love to know. Again,a great thought provoking piece. I found this a very interesting article. As gardeners who had the benefit of taking part in one of your workshops, I can confirm it had a significant effect on how we continued to develop our garden - possibly because of my simultaneous discovery of the complex ecology of a typical UK hay meadow - not just plant diversity and interaction, but fungi and invertebrates all involved in the most amazing symbiotic and parasitic existences. But also creating communities which constantly shift from season to season, and invariably provide huge aesthetic pleasure during their peak season. As you know we'd already been shifting our garden planting towards insect friendly flowers, on the basis that this is key to creating such diverse and stable, yet mobile, plant communities. I've thought for years that the plant hunters who've brought the UK plant novelties from around the globe, and more recently the plant breeders who throw out variants, completely ignore this BIG other half of the very raison d'etre for flowers on plants. The current RHS Pollintor friendly logo being a frequently poorly researched guide to helpful plants in this regard, and I suspect an eagerly seized marketing aid to the public. Still things are moving in the right direction. Having just begun to do more formal bumblebee surveys in both our garden and meadows ( thanks to the great work of Bumblebee conservation Trust) it confirms the huge value that "well" planted gardens can have for our native insects, and it has also thrown up more examples of native insect communities focused around single UK native plant species. In this case the fantastic Common Knapweed - a garden worthy perennial if ever there was one. (Google Varley's research on gall flies and ichneumon wasps for an example = and this observation and research was carried out 80 years ago!!). The final point about such naturalistic or even ecological planting is, I suspect, that although it can be time consuming in its creation, as communities establish over the medium to longer term, provided one understands and can recognise the many plants which build them up at all stages of their development, the input costs in terms of time and money actually reduce, compared with more conventional perennial borders - great indeed for ageing gardeners! Thanks for an interesting blog, Noel. I just saw the Piet O. documentary, so your view was of great interest to me. I’ve followed his work for many years, from a great though admiring distance. Just as you said, the scale is off for most of us. I live on less than 1/4 acre of hilly urban property in Raleigh, NC, the “City of Oaks”. Sure, I’d love to grow (and I do try) all the ornamental grasses and wonderful perennials developed over the past 20-30 years. But I don’t have acres of flat, sunny Dutch farmland. Yet I admire the naturalistic look and try hard to achieve it in the few sunny spots in my yard. I sure don’t have room for the 57,000 perennials that one of Piet’s designs necessitated! It’s fun to dream, though. I have read many books on the New perennial movement and watched a number of lectures including a few of yours on Piet O and also the making of the Olympic Park gardens in London, 2012 with Nigel Dunnet, James Hitchmough and Sarah Price. I am very much moved as a designer and primarily a gardener to make wilder more natural looking gardens and I try and use as many natives as I can. I am an artist/ painter so I don’t limit my material to just natives. I ve been slow to add grasses to the planting because here in Upstate NY I am surrounded by fields of grasses. Unlike in Europe we are trying to carve out from the wild, a tame space. If I didn’t do some mowing the hawthorns, rosa multiflorous, and other thugs would take over the garden. 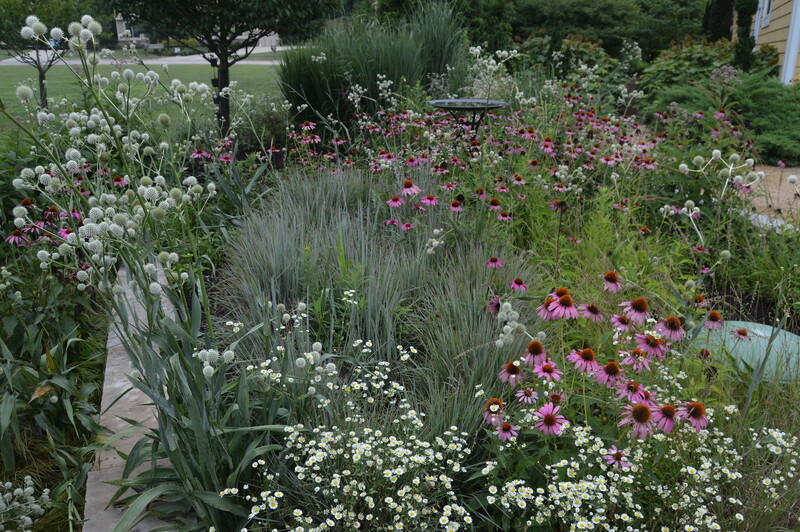 I’ve noticed the plantings with mostly perennials don’t look wild enough without the grasses. 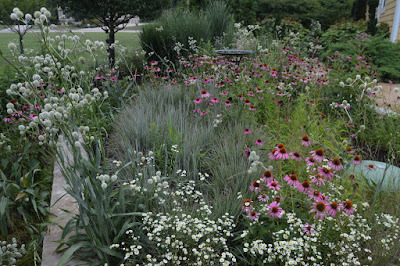 I think planting in just blocks of perennials looks dated, and the wilder more painterly the plantings look the better. In terms of designing for clients, I encourage them to look at gardens that are laid in the New Perennial style. I think as you have reported before there are many directions going on at the moment: the idea of plant communities, going strictly native and the New perennial movement. I am still trying to figure it all out what makes sense to me, but I think the movement towards wilder gardens is the direction of the day. 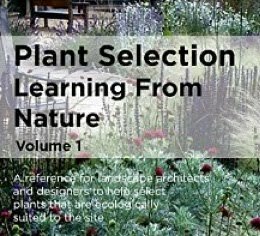 I agree that naturalistic or new perennial planting is mostly being used piecemeal as it suits people to incorporate it into their established planting. As someone who has always back-gardened but who has recently acquired a much larger garden (6acres) and begun to read up about newer concepts of planting, I can sympathise with this. It takes a missionary zeal to dig out your whole garden and start again, as well as considerable expense. And people find it difficult to get away from the idea that their garden must put on a show, a display of choice plants. And it is only too easy, and cheaper, to just buy one of something you fancy at the garden centre rather than plan a season in advance, buying or growing 5-10 of several different things. Also I think that not many people know enough about plants to know what makes a successful plant community. You could just end up with everybody using the same very small tried-and-tested range of plants. But that would be a start, I guess. The naturalistic style is gradually becoming more widespread and familiar - particularly maybe in urban sustainable planting. I would take issue with your comments about conceptual art though! The analogy with gardening is a good one, but amateur artists don't imitate conceptual art because they don't understand it (I would even venture to suggest that you don't understand it!) and with art as with gardening people like what they are familiar with and understand. (Unless they want to be fashionable of course. Even some gardeners are trying to be conceptual!) The avant-garde usually takes several generations to become familiar and acceptable. Amateurs in any area are conservative because they don't have the knowledge and understanding to be anything else; for most people gardening is a very part time hobby and they don't conceptualise it much at all. They just want something conventionally attractive to go with their house that friends and relations will find acceptable. Just as you don't see conceptual art as progressive and developmental and might prefer a portrait or landscape in your sitting room!